Is your building or structure a safety hazard? Maybe you want to revitalize the underlying land, or the structure has simply outlived its usefulness. Don’t try to force an old building to meet your current needs. Costello practices techniques to carefully and surgically pull apart a structure, not simply tear it down. There is no such thing as a routine dismantling job. Every project comes with its own degree of difficulty. Your Costello crew’s skill and experience will make it look easy. Not every project requires roof to foundation demolition. 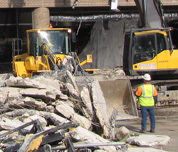 Costello Dismantling puts its interior dismantling expertise to work, keeping the structure’s framework intact while clearing the way for a specific operation or new development. Costello Dismantling doesn’t compromise with cramped spaces. Your obsolete structure might be too close for comfort to neighboring buildings. We hone our precise approach as needed on jobs with high proximity sensitivity. This pinpoint accuracy ensures that your project is carried out in its entirety while leaving nearby structures untouched. When we show up at your project site, your obsolete structure won’t be addressed with equally out-of-date equipment. Costello Dismantling invests in and maintains cutting-edge demolition equipment to ensure your job is carried out safely and efficiently. There will be no machine break downs holding up your project. Costello comes prepared for every job. Not all safety hazards lie in crumbling foundations and compromised beams. We can guide you in the proper techniques to identify and remove asbestos, lead and other hazardous materials prior to demolition. Costello Dismantling will go anywhere to get your job done. Based in Wareham, Massachusetts, we are centralized to serve the entire northeast market. Our New England roots don’t limit us to the Eastern Seaboard. 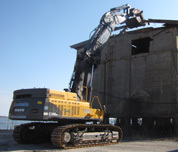 Costello Dismantling’s services are available from coast-to-coast for any project in the continental United States.